The first thing you are going to notice about this website is the fact that you would have a hard time going around it. Good thing that BetChat.com has a search bar for you to search the game of your preference, and for us that would be Poker! The website is using the same technology as other casino websites. 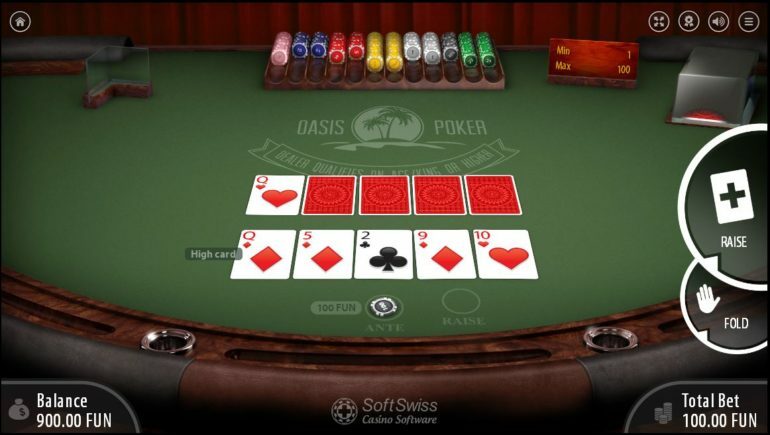 The company “Soft Swiss – Casino Software” are the makers of their software and I really find their tables really nice and professional looking. 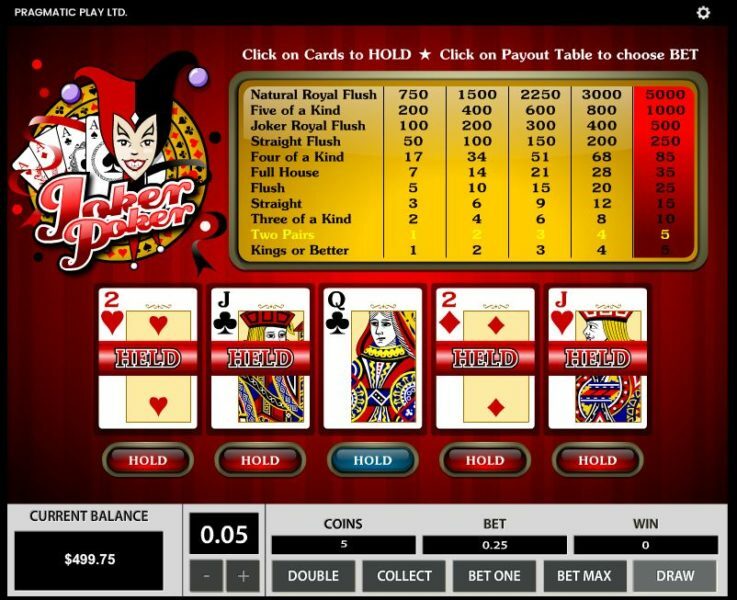 The website is filled with JackPot games, Slots, and Table Games to choose from. But today we would be looking into their Poker game. Ante – 1, 5, 10, 25 and 100 chips. You start the game by sliding your Ante. Once you have decided how much to bet, just click on that and click “Deal” for the game to start dealing the cards. The dealer will give you five cards face up and 5 cards for him with one card face up. You can either Raise or Fold after the first deal. Of course, if you fold you lose; if you click Raise this means that you are doubling your Ante and add additional 200 in the table making the bet 300 if you chose 100 as your original Ante. Ante – Choose from 1, 5, 10, 25 and 100 chips. Once you have decided how much Ante you want to put on the table all you need to do next is to click on “DEAL” and the dealer will start giving out the cards. 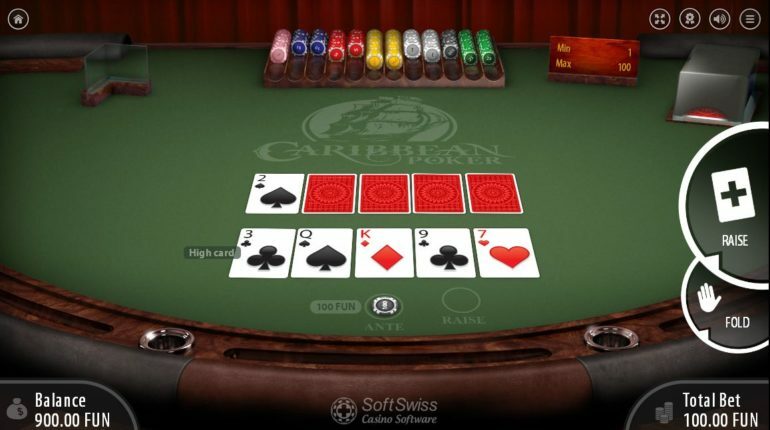 This game is very much similar to Caribbean Poker. Once the dealer hands out the cards you are able to Raise or Fold at this point. Fold would forfeit your current Ante and Dealer wins. If you choose to Raise you will need to put up x2 your Ante. If you have 10 chips for your original Ante, you need to put additional 20 to make the total bet of 30 chips. The game starts as soon as you decide how much your Ante is and or if you want to place a bet for the “Pair up”. Once this has been decided click on “PLAY” and the dealer will give three cards per side. At this point, you can either Play or Fold. If you play additional chips will be required with the same value as your Ante. Ante – Choose from 1, 5, 10, 25, 100 and 500 chips. 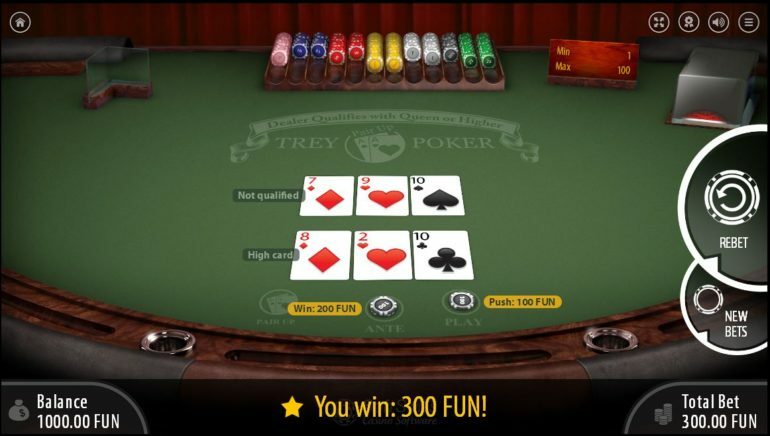 With Triple Edge Poker you are able to choose from 1-3 hands to play with. Once you have decided how many hands you are going to play, choose your Ante and hands to play. The dealer, of course, gives out three cards per hand, then you choose to either Fold or Ride. Ride means keep your current bets and Fold will, of course forfeit every bet placed on the table and the dealer wins. To start the game you need to choose your Ante and the multiplier you want to play with. In order to adjust the multiplier, all you need to do is click on “BET ONE” and this will move your multiplier to your desired level. You can choose from x1 up to x5 multiplier. You can only draw once after you have chosen the cards that you want to keep. Please keep in mind that the barrier between games is not clear enough and you would be confused if you are still playing the previous game or another game. Just keep in mind that clicking on “Deal” means that you are in a new game in which you can draw cards again. In Joker Poker, the Joker card is not useless and works as your second or third card of the hand to create pairs and etc. 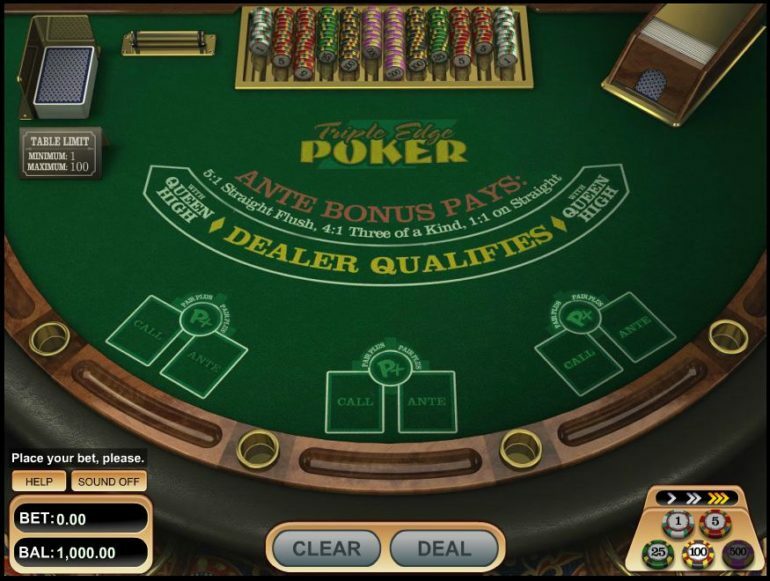 4 of a Kind Bonus Poker is a machine Poker gamer wherein you choose how much you can bet. Click on the amount you want to go with then the machine deals you five cards. 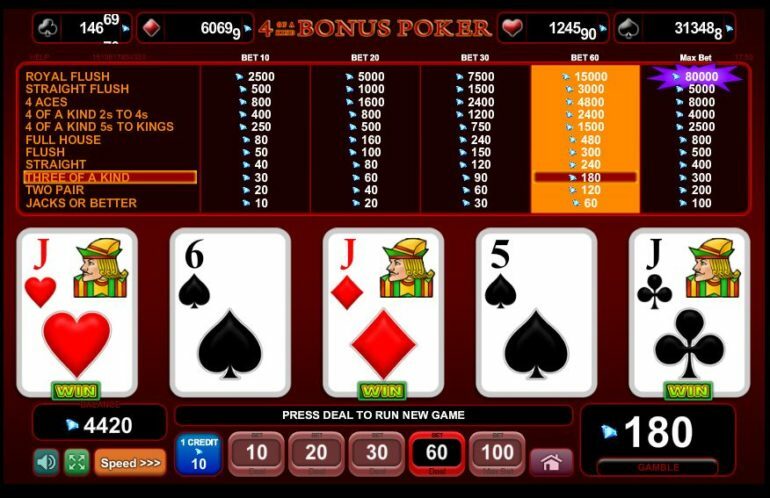 For the first deal, you are able to hold cards before clicking on your bet again (to draw) and continue the game. If you want to have a quick game with a website that has a good gambling software, it would be best to look into BetChan as their tables are awesome. The machine Poker is not one of my favorites but the tables are great to play at! They also host tournaments if you are interested in those.